Please note that the content of this book primarily consists of articles available from Wikipedia or other free sources online. During the years from 1954 to 1981 KapuÅ›ciÅ„ski was a member of the Communist Party (the Polish United Workers'' Party). In 1964, after honing his skills on domestic stories, he was appointed by the Polish Press Agency (PAP) as its only foreign correspondent, and for the next ten years he was ''responsible'' for fifty countries." Since 1965 he traveled around the developing world and reported on wars, coups and revolutions in Africa, Asia, Europe and the Americas including the Football War a "bloody, scarcely believable conflict that Honduras and El Salvador waged in 1969 over a pair of soccer games." When he finally returned to Poland, he had lived through twenty-seven revolutions and coups, been jailed 40 times and survived four death sentences. 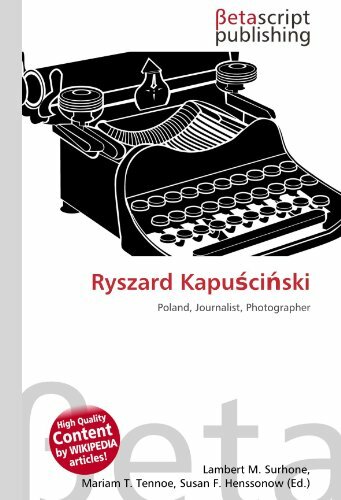 In the English speaking world, KapuÅ›ciÅ„ski is best known for his reporting from Africa in the 1960s and 1970s, when he witnessed first-hand the end of the European colonial empires on that continent. Italian journalist Tiziano Terzani and Ryszard KapuÅ›ciÅ„ski reportedly shared a similar vision of journalism. "